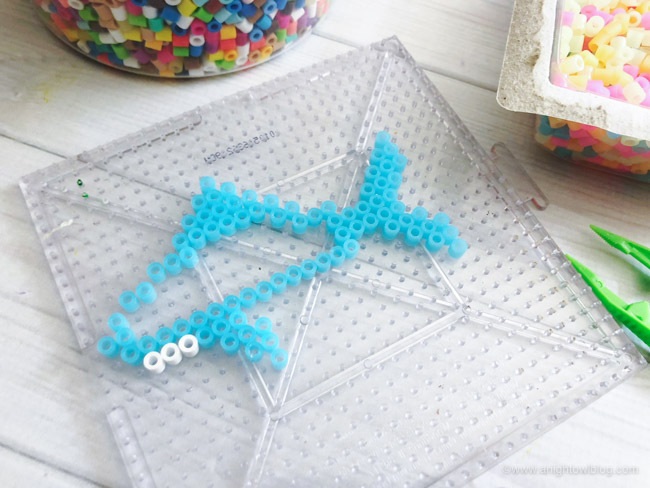 This Shark Perler Bead Pattern to make Shark Keychains is the perfect kid or shark lover activity for #SharkWeek, a Shark Party and more! Hi friends! 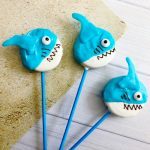 How many of you are glued to the tv this week during Shark Week? I know we are! 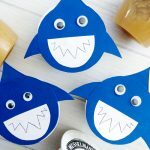 We’ve even taken some time out to do some fun crafts, activities and made some shark treats with the boys. 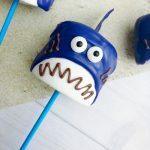 Today I wanted to share one of those fun and easy Shark Crafts with you – adorable Shark Keychains made with this easy Shark Perler Bead Pattern! 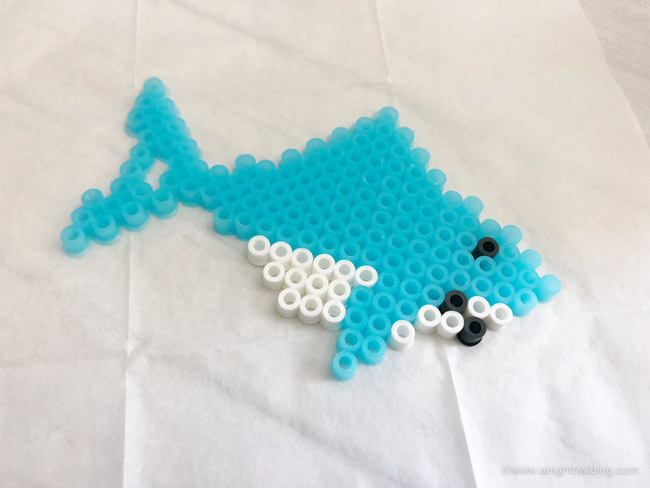 What are perler beads, you may ask? 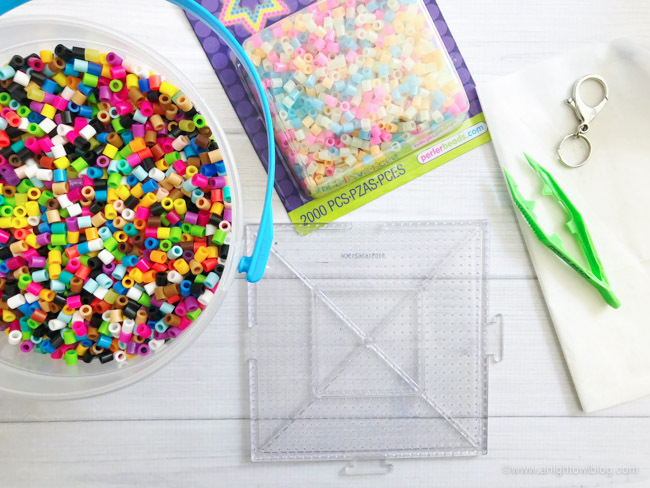 Perler beads are colorful beads usually arranged on plastic pegboards to form patterns and then fused together with an iron. They can also be strung into necklaces, woven into keychains, or even assembled into three-dimensional decors. 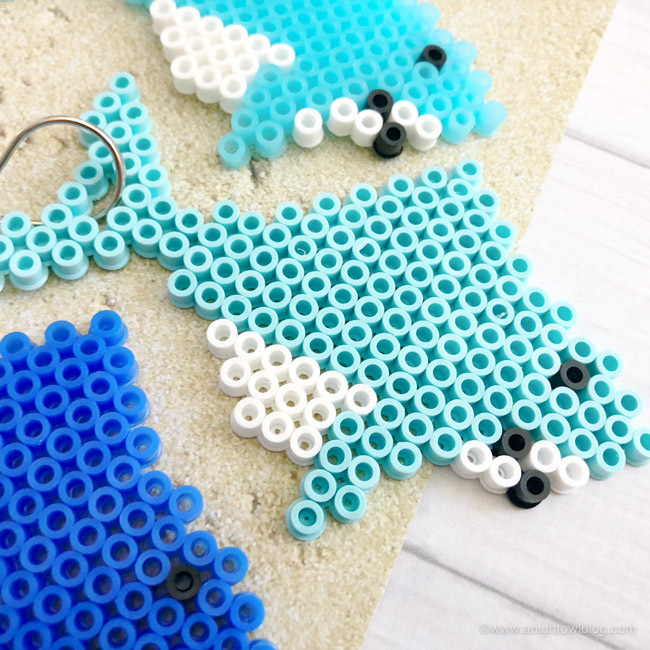 Today we’re showing you how to create adorable Shark Keychains using perler beads, a shark perler bead pattern and more. 1. 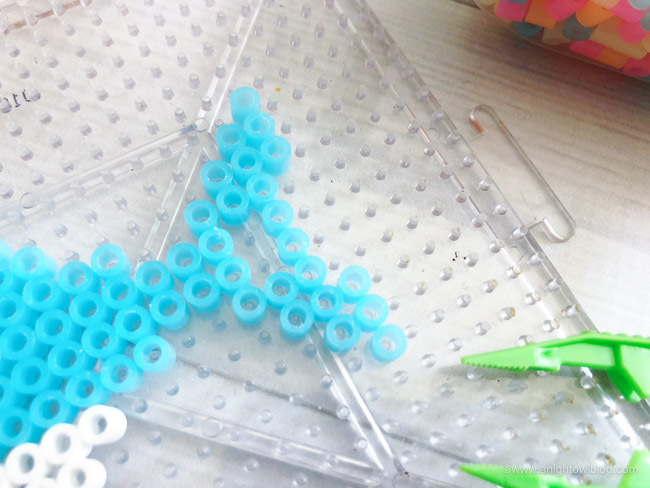 Use your bead tweezers to carefully pick up one blue bead at a time and place it onto your pegboard. It’s easiest if you start at the left side. 2. 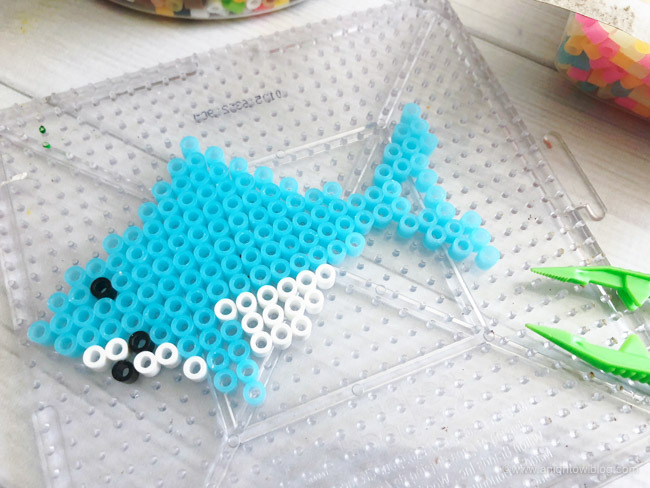 Use your beads to make the outline of the top of the shark. 3. 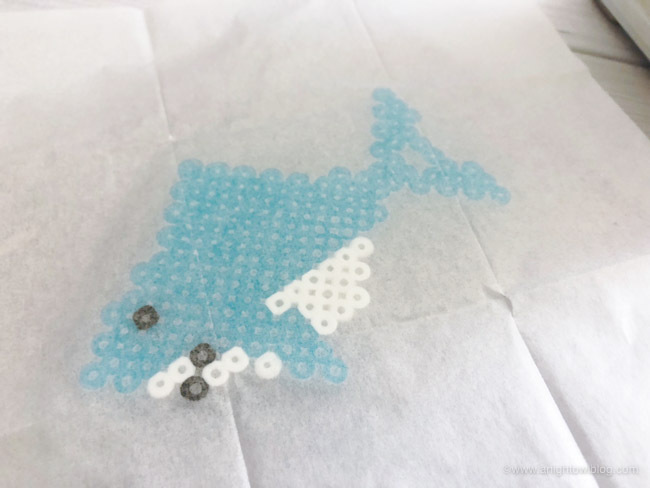 Then use your white beads to outline the bottom of the shark, adding in the few black beads you need. 4. Leave a small 2 bead opening on the tail like pictured. 5. 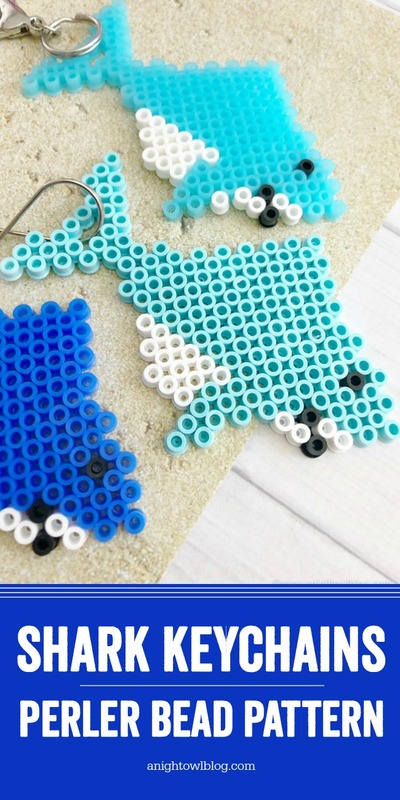 Once your bead pattern is finished, carefully place a piece of ironing paper over top the beads and iron (no water or steam) for several seconds or until you can see the beads start to fuse together. 6. Remove the iron and carefully pull the paper back off the pegboard (careful this will be hot) and peel the beads off the paper and immediately press flat with your pegboard. 7. 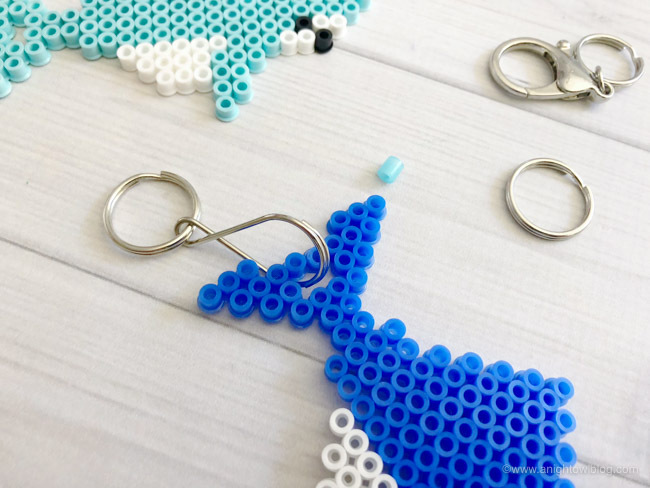 Once your beads have cooled, carefully open the keychain and place it in the two open holes in the tail of the sharks. 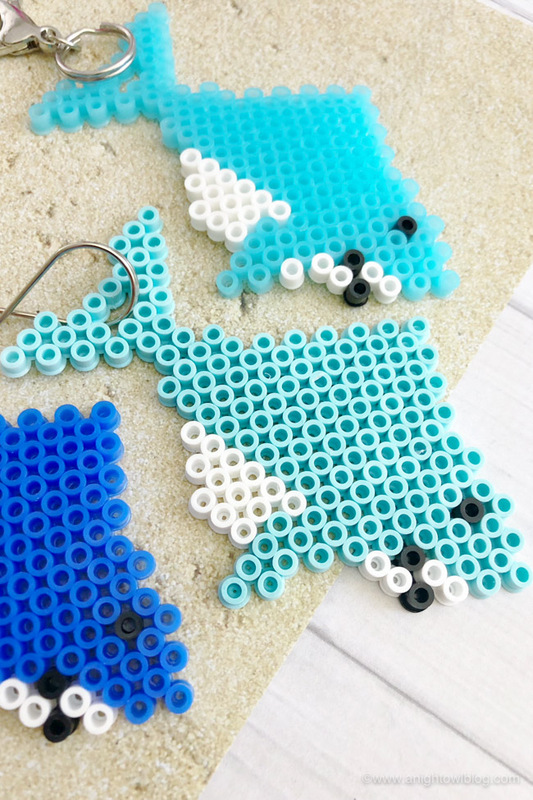 How CUTE are these easy Shark Keychains made with a Shark Perler Bead Pattern?! 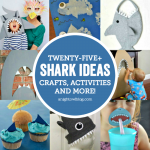 Perfect activity or party favor for you shark party too!